8.30. Tuesday night. 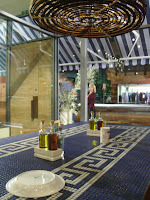 A quiet time for many a restaurant, but at Hellenic Republic it may as well be Cup Day. Our dinner at Hellenic was long overdue, an unexpected move (within the suburb, thankfully) having thrown a few unlaid plans into confusion. Since its birth last December, Hellenic has not wanted for custom. We chose a Tuesday evening in an attempt to bolster our chances of getting in. The place was rammed, with plenty of fresh diners arriving after our 8.30 allocation. There's no surprise in this. George Calombaris is one of Melbourne's most vaunted chefs, and the opportunity to eat his creations in the burbs and in budget is pretty irresistible. His restaurant is not without resistance, however. On the day we dined Epicure mentioned that nearby residents are applying to Moreland Council to re-zone parking in the area. With all these greekophiles flocking to the northern end of Lygon St, residents of Stewart St are suddenly having to circle the block to find somewhere to park. It's the precise problem experienced by residents of nearby Mitchell St, on the corner of which sits the unassuming shopfront of i Carusi. I have a very simple solution to both problems: equidistant from the two restaurants lies a McDonalds. Bulldoze it, lay the turf with any leftover burger meat, and bingo, there's a carpark. To digress momentarily into municipal issues, the residents have a pertinent point. I'm thrilled to have Calombaris in the neighbourhood, but I ride and walk everywhere. If I wasn't a food fan, and never intended to visit Hellenic, it would be galling to suddenly lose a fundamental aspect of my home. Having grown up near an ever-expanding shopping centre in Newcastle, I've known for a long time that increased traffic flow rarely seems to stop council approval of projects that bring in as much dosh as cars. Back to our visit. We successfully resisted the banquet (for which there are three options, and the cheapest, at $49, can seem tempting), all reports being that it's simply way too much food. Our ordering was not adventurous; we stuck with the dishes raved about on blogs and in newspaper articles all over the city: lamb from the spit, beetroot with yoghurt and cumin, kalamari, hand-cut chips and the famous kefalograviera, served with peppered figs. Our dishes were a straightforward representation of Calombaris' commitment to the staples of Greek cuisine: the meats, the cooking styles and the flavourings. Let's talk about two other staples, bread and water, which, despite being fundamental to most dining experiences, are so often mishandled. We had two breads at the table - we ordered pita bread off the menu ($3.50), and a basket of leavened bread arrived with the first two plates. I find that peculiar, when a diner orders bread they need to pay for and is then brought the house bread regardless. While the pita bread was particularly pliant and a perfect wrap for the lamb, I couldn't believe that it was the fifth item brought to the table, after the beetroot, saganaki, lamb and potatoes. You wouldn't expect a curry to arrive minutes before rice, and it's the same with bread. Particularly in a restaurant that follows the trend of having a 'bread station': just slice it, get it in the basket, and the waiter picks one up on the way through with the first round of cooked dishes. We also weren't offered any water, which to my mind should happen without the waitstaff even realising they're reaching for the (in this case cutely raffia-twined) bottle. Minor points? Maybe. But Calombaris is clearly riding a huge word-of-mouth swing at the moment. 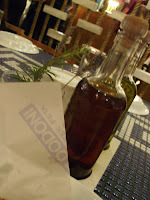 I'm enthusiastic about the place, but it does take some canny consideration to come out with a well-priced dinner (ours, with two glasses of wine and an ouzo, was just under $100. We were very full, so I think we got it pretty right.) Others are far less so, and still regard this as jazzed-up Greek - every post, whether for or against, produces a range of comments protesting one way or the other. I remain a fan of Calombaris' cooking - one could eat well on the lamb and saganaki for a long time - but no matter who's behind the pans, nor what genre of dishes they're producing and what price lies against them on the menu, I'll always give credit to a restaurant that remembers the basics, and when we're talking food, you can't get much more basic than bread and water. Thanks for the comment Kaylee, much appreciated :) Nice to know that you've been visiting the blog, and I hope it keeps on maintaining your interest! Those are some serious steaks in the banner photo on your blog!